Card sorting is a technique used by information architects that is used as input for defining stucture of a website or a product. The subject experts or "users", are suppose to create a category tree or folksonomy from the information provided. Creating folksonomy helps in designing information architecture, workflows, menu structure or web site navigation paths. Card sorting helps to build the structure for a website, decide what to put on the home page, and label the home page categories. It also helps to ensure that you organize information on your site in a way that is logical to your website users. It is most helpful while designing a navigation structure for an environment that offers an interesting variety of content and functionality. Card sorting is a user-centered design method for increasing a system’s findability. The method involves users in grouping information by sorting a series of cards, each labeled with a piece of content or functionality, into groups that make sense to users or participants. Participants in a card sorting session are asked to organize these cards or content in a way that makes sense to them. Participants are also suppose to label these groups.Thus card sorting can provide insight into users’ mental models, illuminating the way that they often tacitly group, sort and label tasks and content within their own heads. 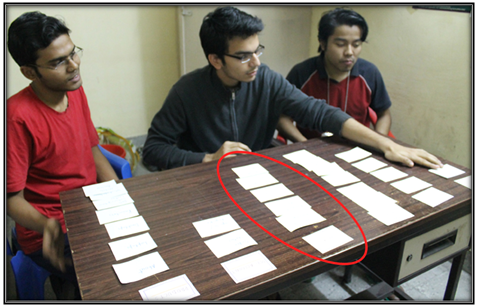 Open Card Sorting: Participants are given cards with no pre-established groupings. They are asked to sort cards into groups that they feel are appropriate and then describe each group. Closed Card Sorting: Participants are given cards showing site content with an established initial set of primary groups. Participants are asked to place cards into these pre-established primary groups. Closed card sorting is useful when adding new content to an existing structure, or for gaining additional feedback after an open card sort. Simple – Card sorts are very easy to implenent by organizers and participants as well. Cheap – Cost of a stack of 3×5 index cards, sticky notes, a pen or printing labels, and your time. Quick to execute – Can perform several sorts in short time, that gives significant amount of data. Established – The technique has been used for over 10 years, by many designers. Involves users –Information structure suggested by a card sort involves real users and hence it should be easier to use. Variety in the items to be organized is large. Similarities among items make them difficult to divide clearly into categories. Users may differ significantly in how they view items & groupings of items. Designer has to explore how people group items, so that he can develop structures that maximize the probability of users being able to find items. Designing a new area of a site. Research into what users need out of the site.